We are now into the second half of the school holidays and summer fun still doesn’t have to cost a lot of money. There are several ways to keep the kids busy this summer without breaking the bank. 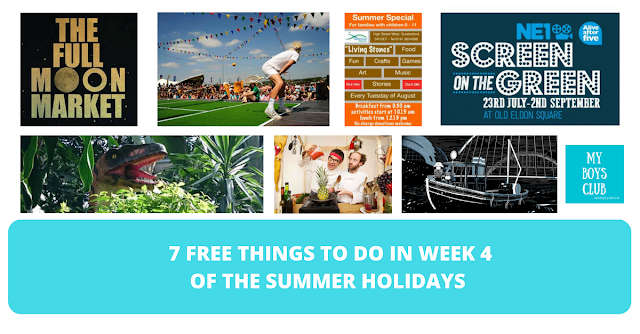 So here are 7 free things you can do this week with your family in North East England now that we are in the fourth week of the summer holidays. The weather is more changeable this week so there are some great indoor options included this week too. 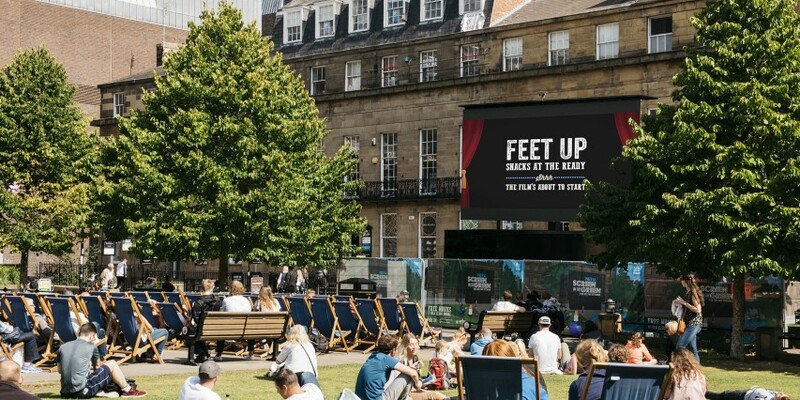 Old Eldon Square is once again home to NE1’s ever-popular summertime attraction, Screen on the Green. For the 3rd year running, Old Eldon Square will house a giant screen for 6 weeks of free, open-air movies. The programme has something for everyone to enjoy, all free of charge and available to view open air, whatever the weather. Films will be screened at 12pm and 6pm each weekday with weekend showings will be 12pm and 3pm. Hidden amongst the lush vegetation of our indoor garden a whole series of amazing dinosaur models are waiting to be discovered. See a baby T Rex as it hatches from its giant egg, watch a stegosaurus and a triceratops grazing on the greenery and spot some pteranodons flying over-head. Hunt down a velociraptor before it finds you and try not to disturb the sleepy crocodile as it lurks by the pool. The collection now also includes an impressive 3-metre high utahraptor, a baby Camarasaurus and a huge pterodactyl with a 2-metre wingspan. 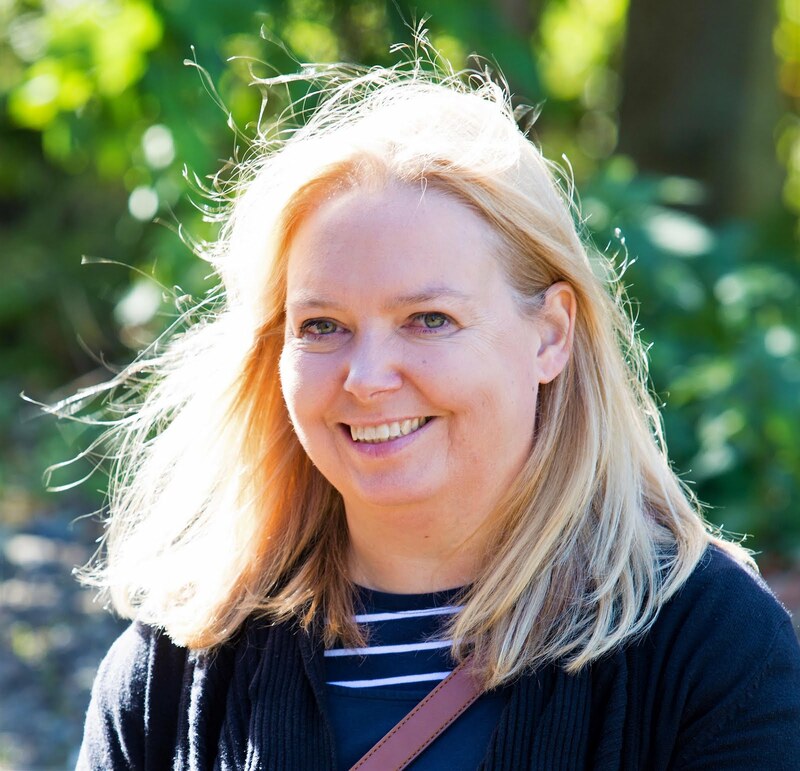 Head along and take part in the Summer Special activities at The Sunderland Minster. All activities are fun and free. For families with children from 0 -11 years of age. 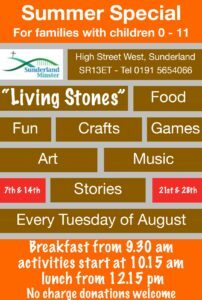 From 9.30am there will be food, games, songs, stories and lots of fun. There is no charge but donations are welcome. 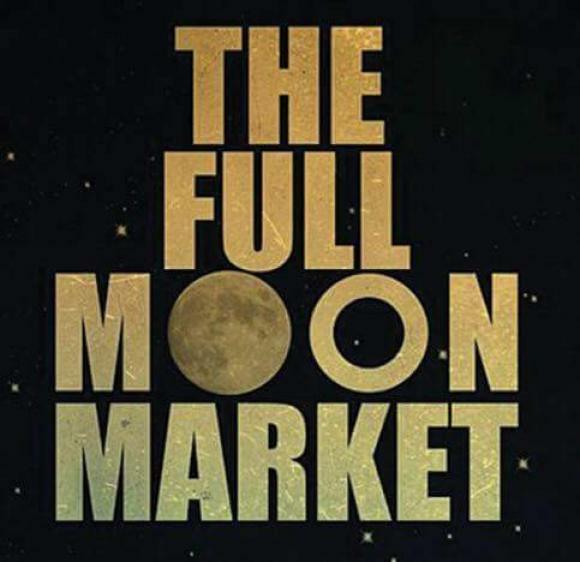 The Full Moon Streetfood Market is back in Durham city centre from 4 to 9pm, with a great choice of food, fabulous flavours, a guaranteed wonderful atmosphere and all well and truly welcome! It really is an event for the all ages, from the youngest to oldest! 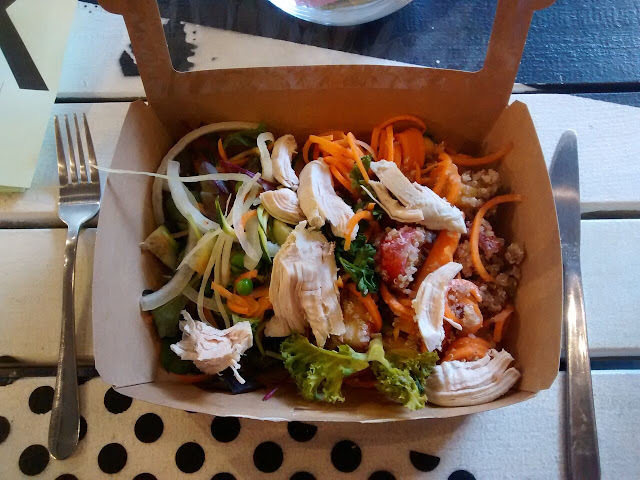 Here's who you'll find offering you streetfood ... from 4 to 9pm … The Asian Project, The Greek Kitchen, The Green Guerrilla, Fat Hippo Fleet, Perissa, Kimchi Planet, Earth and Fire Pizza, The French Pop Up, The Belgian Waffle Tuk, Smokie Dokies, Coffee Supreme. And there is live music throughout the evening as part of the Live InDurham events. Get ready for a summer of treasure-seeking fun with the Mischief Makers! For this year’s Summer Reading Challenge The Word is off to Beanotown, where rumour has it there’s a treasure chest full of epic pranks waiting to be discovered. Say hello to Pieface, Rubi, JJ, Gnasher, and the ultimate mischief maker: Dennis! 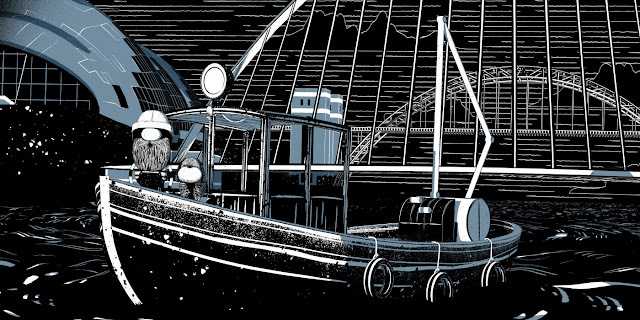 They’re on the trail of the hidden treasure, and they’re looking for some more friends to join in the adventure! 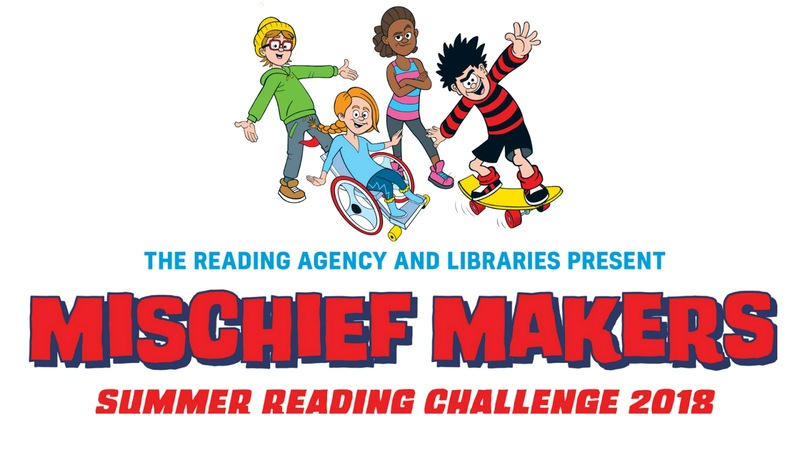 Sign up at The Word and read six library books of your choice to complete the challenge and see if you can help the Mischief Makers find the box of tricks. It’s completely FREE to take part! All children who sign up will be given a map of Beanotown to keep a record of their journey as well as receive a certificate and medal when they have completed the challenge. Dennis and his friends will be with you every step of the way to give you clues and show you how to be a Mischief Maker too! A live cook walk about theatre show; cooking ‘Al Tesco’! 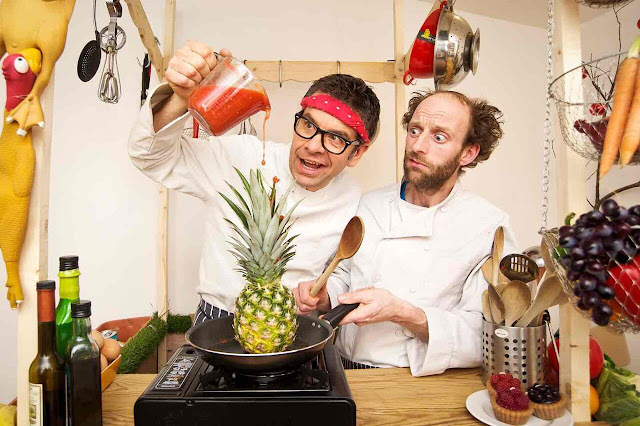 The comedy chefs Hugh Fearn and Lee Whittingstall present a cookery demonstration like no other- a fusion food on the move blending home-grown ingredients with food foraged from the corner shop, the streets and of course the audience. Their signature dish “Pan-fried pizza crusts with medallions of air-dried chewing gum” has been hailed by the critics as “ground-breaking”, “audacious” and “chewy”. Strawberries - Cream - Action! 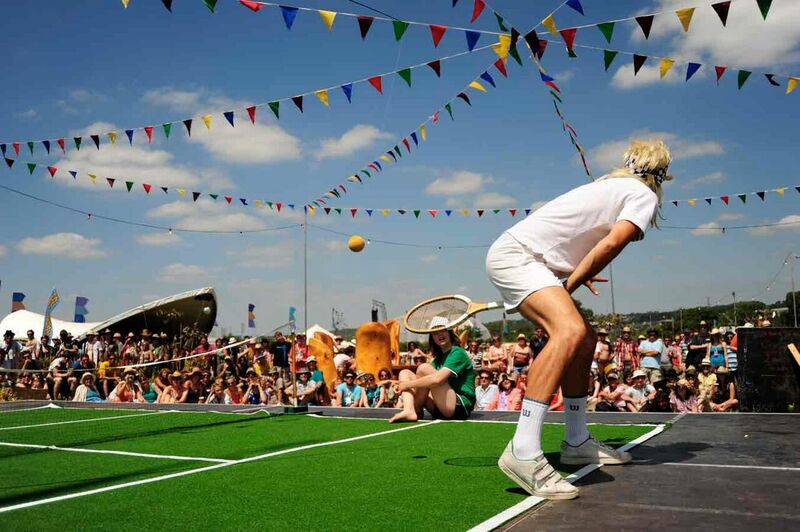 Britain's top 'miniature, outdoor, comedy tennis show' has just gone mobile. Pulling the court, scoreboard and posh umpire behind him, our highly-strung tennis player searches for worthy opponents. The ensuing comedy matches will feature everything about tennis that we love the best ... painful injuries, temper tantrums, and of course slow-motion replays. North East England has a wealth of free family days out, easily accessible and full of fun – and the best thing is if you take your own lunch they can be really frugal days too. 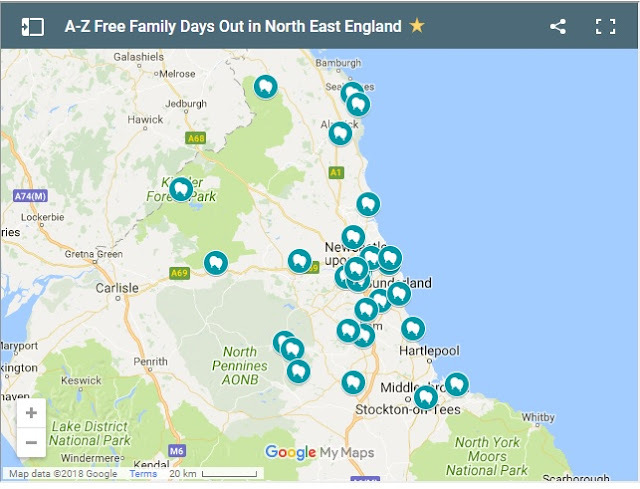 We’ve pulled together a handy A-Z list with a map of free family days out.